Introduction: In this article i am going to explain with example How to maintain or preserve the password value in the TextBox controls during/on/while/even after the occurrence of post back event in asp.net using both C# and VB.Net languages. I have also explained how to clear maintained password on cancel or reset button click. Description: While working on project i got the requirement to create a registration form having the TextBox for User Name, Password, Confirm Password and DropDownList for State and City. The AutoPostback property of the State DropDownList was set to true so that corresponding cities can be populated in the city DropDownList based on the selected state. But i faced an issue that whenever i select any State then post back occurs due to the AutoPostbBck propery of the DropDownList, the entered values from the Password and Confirm Password TextBox get cleared. Actually it is the default nature of the TextBox control whose TextMode property is set to password. 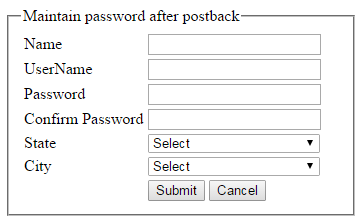 But i want to maintain whatever password i have entered in the textbox across postback. Here in this article i have explained the solution for this problem. Inside page load event i first checked whether it is postback, if yes then i am setting the value attribute of textbox with the value of password textbox. However retaining password is considered to be security hole so it is not preferable to retain password between post backs. Implementation: Let's create an asp.net sample website to see it in action. Useful document.it could help us to keep things in mind.